Packaged, manufactured pet food is a great convenience to dog and cat guardians. But responsible consumers who want the best for their animal companions have a bewildering array of foods and claims to choose from. So, how do you know what’s best for your animals? The most reputable manufacturers agree with holistic veterinarians that the very best diet for your animal companion is one that you make yourself. A homemade diet, carefully balanced nutritionally, and using raw and organic foods, is closest to what Mother Nature intended. However, many of us do not have the resources to make our pets’ food, especially for multiple animals or large dogs. So, for those of us who rely, partially or entirely, on commercial foods for our animals, here are some guidelines to use in selecting a good-quality diet. The name of a pet food is strictly defined and tells us what is actually in the food. “Chicken Dog Food” must contain at least 95% chicken (excluding water). 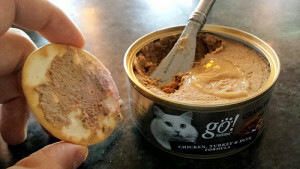 “Fish and Giblets for Cats” must be 95% fish and giblets together, and there must be more fish than giblets, since fish appears first on the label. If the label says “dinner,” “platter,” “entree,” “nuggets,” “formula,” or similar term, there must be 25% of the named ingredients. That is, “Fish Dinner” must contain 25% fish. If more than one ingredient is named, such as “Fish and Giblets Entree,” the two together must comprise 25% of the total, and the second ingredient must be at least 3%. A food labeled “Fish and Giblets Entree” may contain anywhere between 13% fish and 12% giblets, to 22% fish and 3% giblets. An ingredient labeled as a “flavor,” such as “Beef Flavor Dinner,” may not actually contain beef meat, but more likely will contain beef digest or other beef by-products that give the food a beef flavor. It used to be that non-meat ingredients didn’t count on the main label, so food labeled “Chicken and Rice Dinner” still had to contain 25% chicken. However, the rules have changed, so now “Chicken and Rice Dinner” could contain 13% chicken and 12% rice and be legally labeled. Multiple studies have found many mislabeled pet foods and treats. In some cases, ingredients are present in the food but not disclosed on the label; this is a serious problem if a pet has a food allergy, because the food may contain undeclared allergens. On the other hand, some products contained none of the primary ingredient as stated on the label. The pet food industry has thusfar demonstrated no interest whatsoever in fixing the problem, although regulators are aware of it, and are looking for a solution. Even on many high-priced, premium, and veterinary brands, you will notice one of the major ingredients listed is “by-products” of some sort. By-products are basically “parts other than meat.” These may include internal organs not commonly eaten by humans, such as lungs, spleens, and intestines, other parts such as cow udders and uteri, and in the case of poultry by-products, heads, beaks and feet. By-products must be from “freshly slaughtered” animals, although there is some question as to how fresh they really are by the time they reach the pet food manufacturer, as they may be shipped in unrefrigerated trucks. By-products are usually found in canned foods, where they are often the only source of animal protein. While a hunting cat or wild canine would eat the by-products as well as the meat, a named meat should be the mainstay of a carnivore’s diet. Animals that are dead, dying, diseased, or disabled prior to reaching the slaughterhouse are known as “downers” or “4D” animals. These are usually condemned, in whole or in part, for human consumption, and are generally sent for rendering along with other by-products, parts and items that are unwanted or unsuitable for human use – such as out-of-date supermarket meats (along with their plastic wrappers), cut-away cancerous tissue, parasitized livers, and fetal tissue (which is very high in hormones). Rendered ingredients vary greatly in quality. Some rendering facilities are closely associated with slaughterhouses, which are in turn connected with feedlots or poultry farms. These “captive” rendering plants are more likely to produce good quality, relatively pure meals. Such meals are typically designated with the name of the source animal, such as “chicken meal.” Independent renderers take all materials from an area, from roadkill to dead livestock. Many independent renderers accept for processing such items as road kill, euthanized shelter dogs and cats, and other unappetizing ingredients. These items can be segregated from the food stream, and are not supposed to find their way into the pet food chain, but this is not always done. They are supposed to be converted for use in fertilizers, livestock feeds, and industrial applications. Over the years there have been numerous unsubstantiated reports of this material being processed into dog and cat food. The Center for Veterinary Medicine, a branch of the Food and Drug Administration, admits that dead dogs and cats are commonly rendered, and although there is no legal prohibition against using dogs and cats in pet food, they do not “condone” the practice. All the large, reputable pet food manufacturers certify that they do not use such materials in their products. Because of the way they are processed, most dry foods use meals as their major animal-source ingredients. Meals do contain more protein than whole meat, since the fat and water have been removed. A food may be labeled as “complete and balanced” if it meets the standards set by a group called AAFCO, the Association of American Feed Control Officials. Standards set by AAFCO have been adopted by most states; the states are responsible for enforcement. A food may be certified by AAFCO in two ways: (1) meeting published standards for content, or (2) feeding trials. (1) Nutrient Profiles. These standards set the required amounts of protein, fat, vitamins, minerals, and so forth. These theoretically have the benefit of extensive research behind them. However, even though these profiles were updated as of 2016 by panels of canine and feline nutrition experts, the data they are based on were largely published before 2003, and are already more than a decade out of date. Moreover, any manufacturer can synthesize a food containing sufficient amounts of each ingredient according to the standards, yet an animal will ultimately starve to death on it. How could this happen? Because the standards do not address the issues of “bioavailability” of nutrients to the animal. Certain forms of vitamins, minerals, and amino acids are poorly absorbed from the digestive tract. A noted veterinary nutrition textbook claims that a food can be created from old leather boots, wood shavings, and crankcase oil that will meet the technical requirements for protein, carbohydrates, and fats, yet would be completely indigestible. Unfortunately, given the ingredients used by some manufacturers, “Old Boot” may be closer to the truth than anyone wants to admit! (2) Feeding Trials. These are considered the “gold standard” of pet food formulation. However, when you look at the actual AAFCO protocols for an adult maintenance diet, a manufacturer must feed exclusively the test food to only six animals for six months. (Eight animals are required at the outset; however, two of them may be dropped from the trial for “non-diet-related” reasons.) Foods intended for growth and reproduction must be tested for only 10 weeks. Several of the largest pet food producers, such as Hills, Walthams and Purina, maintain their own colonies of dogs and cats, and test their foods on hundreds of animals over years or even multiple generations. Other manufacturers rely on testing facilities that keep animals for this purpose to do the studies for them. It is easy to see how a poor quality diet could be fed for only six months without seeing adverse health effects, and legitimately be labeled as meeting AAFCO standards. In fact, studies have confirmed that even foods that pass feeding trials may still be inadequate for long-term maintenance. Worse still, AAFCO passed the “family rule” making it legal to put the feeding test statement on the labels of foods that were not actually tested, but are “similar” to one that was. The criteria for being “similar” are very loose. Since there’s no way to tell which food actually passed a feeding test, this label designation is useless. Keep in mind, too, that the standards, such as they are, set only “minimums” and “maximums,” not “optimums.” Commercial foods are designed to be adequate for the average animal, but may not be suitable for an individual animal’s variable needs. Preservatives are necessary for some ingredients; and for dry food in particular, since it tends to be stored for long periods before using. Some of the most dangerous synthetic chemical preservatives are BHA, BHT and ethoxyquin. Monsanto, manufacturer of ethoxyquin (a rubber stabilizer), in 1993 was ordered to conduct a new study of this preservative due to faulty test protocols and alleged doctoring of data in its initial report. Not surprisingly, the second study, completed in 1996, found no problems associated with ethoxyquin in pet food. Given Monsanto’s track record and reptuation, do you believe this? Ethoxyquin is banned from nearly all human food products (except certain spices) due to its cancer-causing properties. Another concern is pesticide residues, antibiotics, and molds in various pet food ingredients. Glyphosate, another Monsanto creation and the active component of the herbicide Roundup, isn’t even tested for by USDA, and is a major contaminant of the genetically engineered corn and soy used in pet foods. Meat from downer animals may be loaded with drugs, some of which are known to pass unchanged through all the processing done to create a finished pet food. One toddler who habitually snacked from the cat’s bowl of dry food died of an allergic reaction to penicillin, which was found to be in the cat food (Purina Cat Chow) at levels over 600 times the limit allowed in human food products. In the 1990s and 2000s there were major recalls of dry dog food by different manufacturers due to mold contamination of grain ingredients. Some fungal toxins are very dangerous; more than 120 dogs have died due to contaminated dog food. When selecting a commercial food for your animal companion, be sure to read the label. Although percentages are misleading due to the variable moisture content of processed foods, they are often the only data available. Avoid foods containing “by-product meal,” “meat and bone meal,” or euphemisms like “beef and bone meal,” which tend to be the least expensive (and thus poorest quality) animal-source ingredients. “Meat and bone meal” (MBM) is the mammal equivalent to “by-product meal” (which applies only to poultry). MBM was reported as the ingredient most likely to contain the drug used for euthanasia (sodium pentobarbital) in a study conducted by the FDA. .
A named meat or meat meal should be the primary protein source, rather than a cereal like corn gluten meal, rice protein concentrate, pea protein, or other cheap meat substitute. Corn and soy in all their forms must also be avoided. The feed-grade corn and soy used in pet food is certain to be genetically engineered. In low-priced foods, corn gluten meal is often substituted for expensive meat ingredients. All grains are susceptible to mold and other toxins. Because the pet food makers have gotten pretty clever about marketing, it’s important to know how to see through the hype. For more about pet food marketing ploys, see this article. Never feed “semi-moist” type foods, which are full of additives, colorings, texturizers, and preservatives. Avoid foods containing chemical preservatives such as ethoxyquin, BHA, BHT, propylene glycol, or propyl gallate. Many brands are now preserved with Vitamins C and E instead of chemical preservatives. While synthetic preservatives may still be present, the amounts will be less. In general, select brands promoted to be “natural.” While they are not perfect, they tend to be better than most. Stay away from “light” or “senior” or “special formula” foods. These foods may contain acidifying agents, inadequate protein, excessive fiber, and poor quality fats that will result in skin and coat problems. Avoid generic or store brands; these may be repackaged rejects from the big manufactures, and certainly contain cheaper – and consequently poorer quality – ingredients. Change brands or flavors of dry food every 2 or 3 months to avoid deficiencies or excesses of ingredients, which may be problematic for your animal. Whenever you are changing foods, remember to GO SLOWLY. Add a tiny amount of new food to old, and gradually increase the proportion of new food. It will take a week or two to properly transition a cat. Click here for more info on why and how to change foods. With canned food, you can change flavors daily if you wish–my cats prefer it that way! If you must feed dry food, remember to never get it wet, even if the package says it’s okay. Do not mix kibble with canned food, milk, broth, or water. All dry foods have bacterial contamination on the surface, and moisture will allow those bacteria to grow. Some are dangerous, and cause vomiting and/or diarrhea. Above all, supplement with organic raw meat and organ meats (all meat should be frozen at -4oF for 72 hours, then thawed prior to use; follow safe meat-handling procedures at all times). If desired, add a small amount lightly steamed, pureed or finely grated non-starchy vegetables (they cannot be very well digested by carnivores otherwise) or organic baby food. Dogs may be supplemented with organic tofu and cooked grains; however, cats should receive minimal carbohydrates in the diet. Be aware that plant products tend to raise urine pH and may contribute to bladder stones and urinary tract disease. Other helpful supplements include Omega-3 fatty acids, probiotics such as L. acidophilus, digestive enzymes, and antioxidants. For much more information on what, why, and how to feed your cat a healthy diet, as well as a complete list of Dr. Jean’s personally-recommended brands, see What Cats Should Eat, now available in our e-Bookstore and on Amazon.com.